Perched on a chair and gesticulating excitedly, a rarity is taking place. 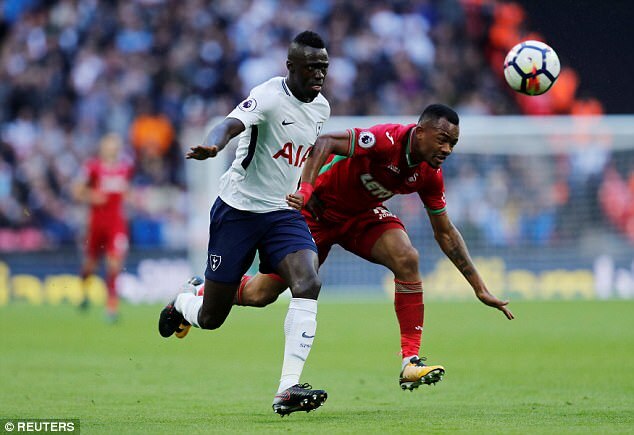 A Premier League defender is extolling the virtues of, wait for it, defending. 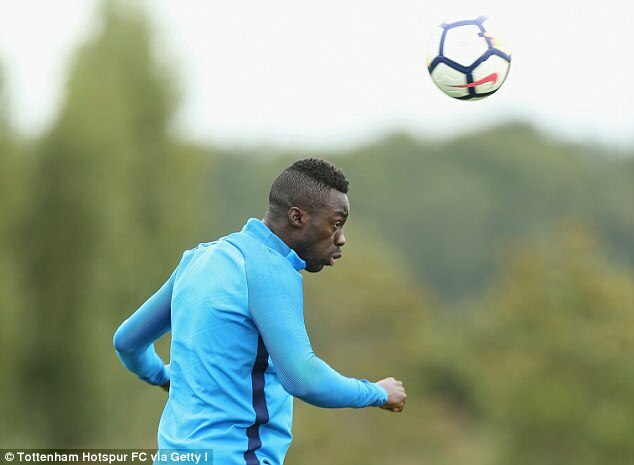 ‘My job title reads defender,’ Davinson Sanchez insists. ‘You can’t mess up your priorities and above all, my job is to keep the ball out of our goal. 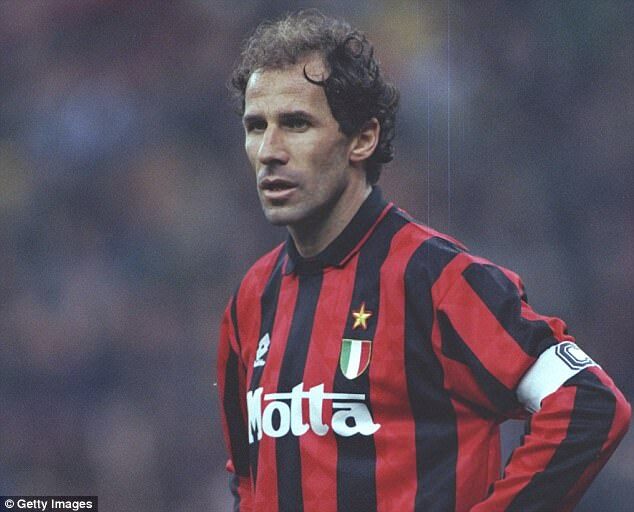 ‘My biggest idol is Franco Baresi, the legendary Italy and Milan defender. I am too young to have watched him live but within the game, everyone tells you about that powerful Milan defence. ‘I researched YouTube videos and downloaded clips to study. Even though it is a different era, there is so much you can still take from a video of Baresi or Paolo Maldini. 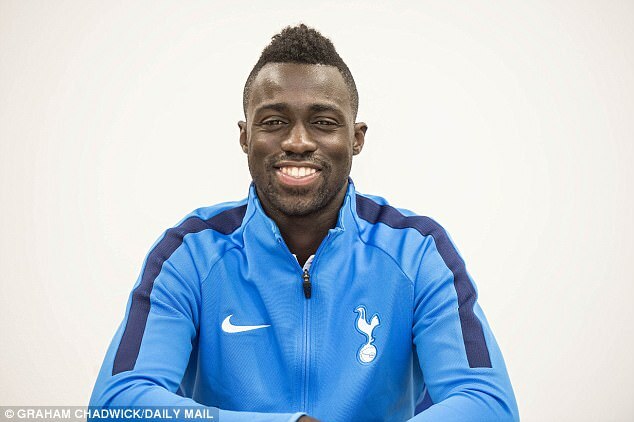 Sanchez, Tottenham’s £38million club record signing, arrives with high expectations. In Amsterdam, he made a powerful impression. Ruud Gullit labelled him Ajax’s best defender since Jaap Stam. The Borussia Dortmund manager Peter Bosz, who coached Sanchez last season at Ajax, describes him as a ‘monster’. He may only have had one season at Ajax but it was sufficiently impressive to earn the Dutch club an extraordinary £34m profit on the £4m they paid to sign Sanchez from Colombian outfit Atletico Nacional last summer. At 6ft 1in, Sanchez is an imposing figure. Tottenham have conceded only one goal in his first three starts including a memorable win over Dortmund in the Champions League. ‘When you come into a new group for a big fee, you want to earn the squad’s respect,’ he says. ‘It’s not insecurity but you want them to trust you. Sanchez talks a lot about hard work. He says the word dedication repeatedly. 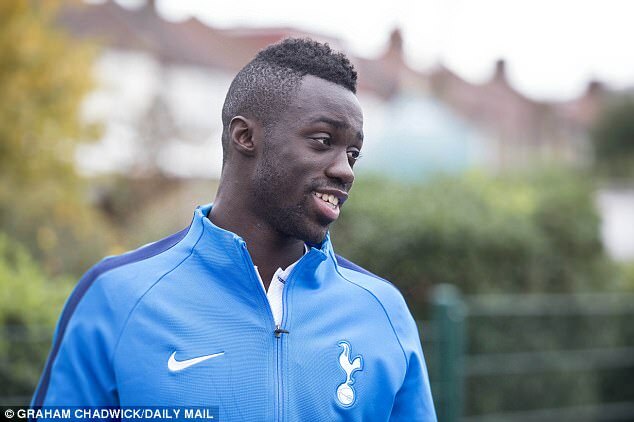 He may only be 21, but it rapidly becomes clear that there is a depth to Sanchez’s character. This is his first major interview since arriving into English football and as he peers through a window and into a school playground, he smiles. Home for Sanchez is Caloto, a town of 30,000 inhabitants in the Cauca department of Colombia. During a civil war that raged for half a century, his hometown became known as one of the most notorious rural hotspots for insurgency and guerrilla warfare. ‘When you are a child, you go to school and all you think about is how many goals you are going to score after class,’ he says. ‘There’s an innocence about it. My parents worried, of course. It wasn’t desperate money shortage but about making sure I didn’t head down the wrong path. When he enrolled in the America de Cali football academy, Sanchez travelled two hours every day after school to training. ‘Dad came to make sure I was safe,’ he recalls. ‘He’d work early hours until lunchtime and then we’d go. ‘His sacrifices were incredible. It’s funny in London. If you go to catch the bus, one passes and it’s, “OK, another is coming in two minutes”. As Sanchez reflects on his childhood, he can recall some of the more difficult days, when his parents deemed it too dangerous to do the simplest things. Sanchez is focused on opportunity. 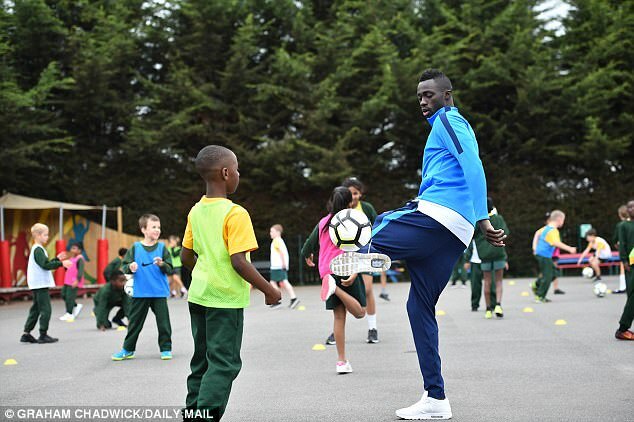 In his hometown, he has launched his own foundation, where dozens of young children are able to play sport. He is here as part of Tottenham’s own community scheme, meeting and greeting children at St Joseph’s Catholic primary school in Wembley. ‘The truth is that many people just do not have the chance to thrive in Caloto,’ says Sanchez. ‘So I wanted to help. ‘I can be an example to show kids you can achieve your dreams. It’s important to change the mentality of young people. I give them an outdoor outlet. ‘We all love PlayStation, but we can’t have kids spending all day doing that. Study, get changed, watch a bit of telly and get outside. After playing in the youth academy of America de Cali, Sanchez signed for Atletico Nacional — a club bankrolled by notorious drug lord Pablo Escobar during the 1980s — at the age of 16 and won the South American equivalent of the Champions League in 2016. Before joining Ajax, interest came from Barcelona. ‘Everyone was telling me, “You have to play in Barcelona: you’re fast, strong, technical, made for it”. 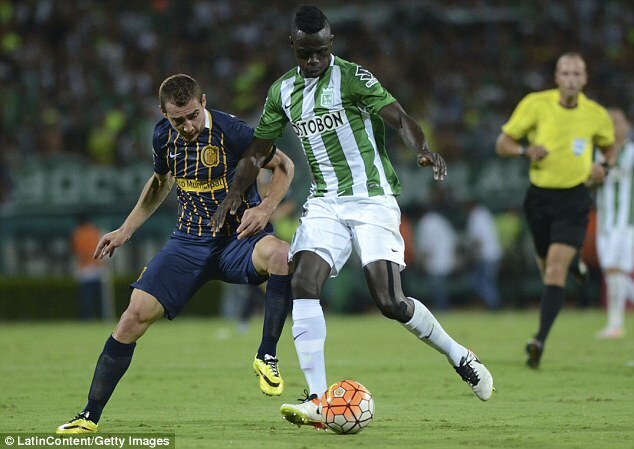 It was initially to play for Barca’s B team, but I wanted continuity at a high level. 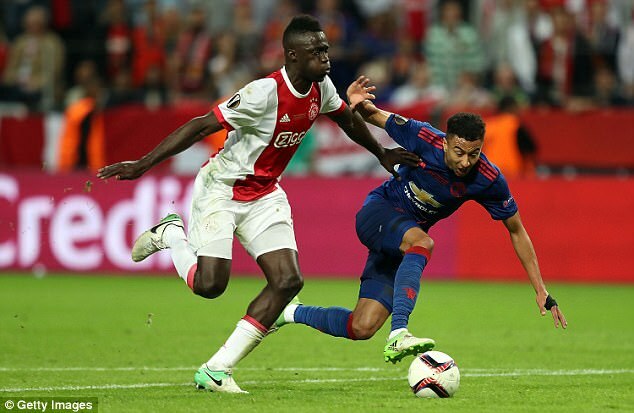 ‘I had a fantastic time at Ajax and we reached the Europa League final. 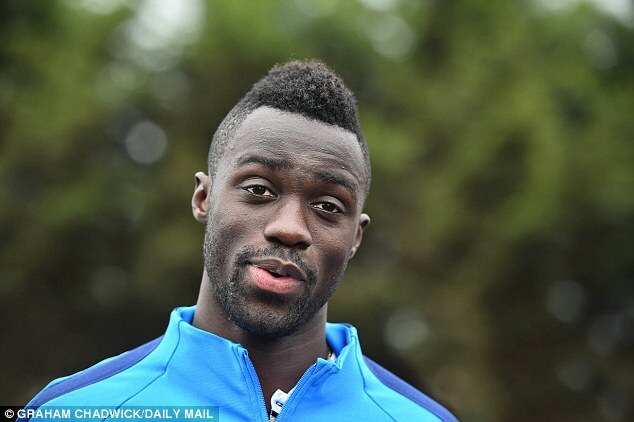 This summer, I heard a lot of noise, but Spurs was the only offer on the table. Mauricio Pochettino is a huge influence. Saturday lunchtime brings a trip to West Ham and one of the more febrile atmospheres he can expect to encounter in English football. A grin breaks out. ‘OK — but I’ve played football in South America. They are a bit special over there! ‘We played in Sao Paulo in the Copa Libertadores and the noise is like nothing you can imagine. You block it out.